Auburn’s Peach Bowl loss to Central Florida early this year appears to have created a ticket-buying opportunity. 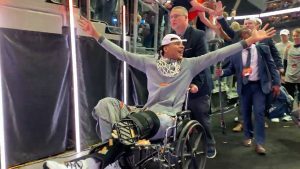 The loss has helped to make 2018 Auburn Tigers tickets very affordable. 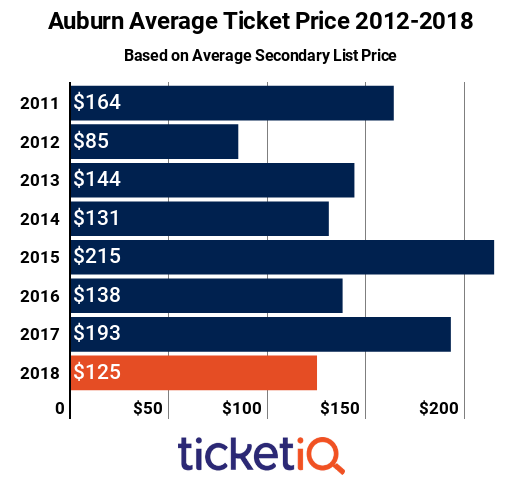 Projected to finish with a winning record for the sixth consecutive season, the average asking price on the secondary market for a game at Jordan-Hare Stadium is $125, the second best value in nearly a decade, according to TicketIQ.com. The only less expensive average was $85 in 2012 — Gene Chizik’s final year and the Tigers only losing season (3-9) in the last nine years. 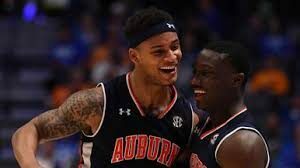 Under Gus Malzhan, the Tigers have won the SEC West twice – last season and Malzhan’s his first season, 2013, when Auburn got to the BCS national championship before losing to Florida State. That year, the average ticket price on the secondary market jumped to $144 (from $85 the previous year) before rising to decade highs of $215 in 2015 and $193 in 2017. 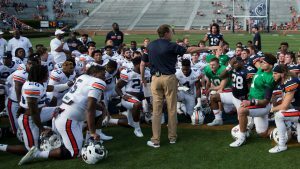 Auburn season tickets are available through the team for $475, and fans can choose from limited lower level and upper level seats. The team is also selling several different four-game packs for $275. Single-game tickets are available on the university’s website. 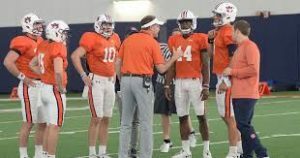 Auburn’s key challenge in 2018 won’t be about whether it can move the ball – quarterback Jarrett Stidham might not be flashy, but he’s proved he can run the offense. How well the Tigers fare will have everything to do with their ability to protect Stidham after graduating four offensive linemen. 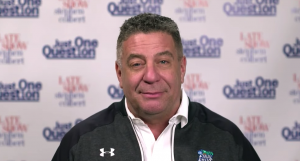 This season, two home games will cost fans an average of more than $200 on the secondary market – the current average asking price is $221 for the September 15 LSU game and $208 for the October 13 Tennessee game, according to TicketIQ.com data. 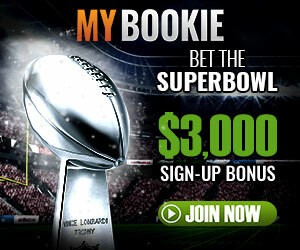 Those two games also have the highest get-in price on the primary market — $125 for the LSU game and $130 for the Tennessee game. Those numbers are well above the cheapest seats at the other seven home games. In fact, the next most expensive get-in ticket on the primary market is $90 for the Texas A&M game (Nov. 30). 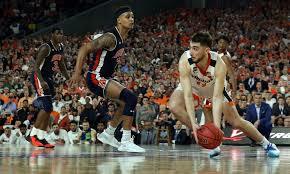 On the flip side, fans can see their Tigers for as little as $25 on the primary market when Auburn hosts the Liberty Flames in the season’s final home game on November 17. The season opener against Alabama State on September 8 is $30. Those two games also have the lowest average asking price on the secondary market, at $55 for Liberty and $59 for Alabama State. On the road, Auburn is commanding a secondary market average asking price of more than $230 for all but one game. The highest average asking price on the road is, no surprise, $543, against rival, co-2017 champion and perennial powerhouse Alabama, on November 24. 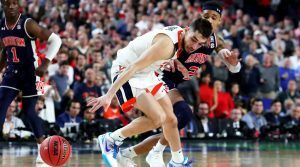 Demand for the November 10 Georgia game has pushed the average asking price to $477. The cheapest road game on the secondary market is $109 at Ole Miss on October 20. Whether you want the best seat in the house or just the chance to be in Jordan-Hare Stadium, visit TicketIQ’s marketplace. Seats in Lower Level 30, Row 20 behind the visitors bench are available for $382 with the company’s Low Price Guarantee for the LSU game, while $11 gets you into the Liberty game in Section 109 high above the action.